Description: Cap 4 to 10 cm across, convex then expanded, becoming wavy, gray-brown to brown, with silky or silvery streaks. Stem 30 to 60 x 10 to 20 mm, tough, fibrous, often eccentric, white at apex becoming brownish towards the base. Flesh whitish. Taste and smell not distinctive. Gills white to grayish. Spore print white. Habitat: Dense (often huge) clusters on the ground, usually in disturbed ground (roadbeds, paths, landscaping areas, etc.) but sometimes in woods. 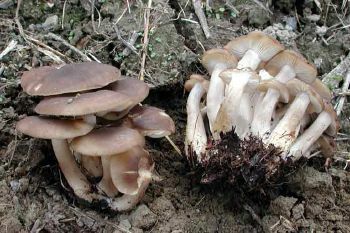 Primary Keys: Dense multi-stalked clusters on disturbed ground; medium cap that is whitish, brownish, yellowish brown, or grayish brown; stalk often curved or even conjoined; white gills but may yellow somewhat in age; absence of a partial universal veil and ring; pure white spore print; mild taste. Edibility: Edible. Some may have problems, so test first! It’s a mild mushroom with a crisp texture that needs thorough cooking, so is better suited to soups or stews. The stems are fairly tough, so caps should be cooked and stems used for purees. Notes: This is a mushroom that you should have identified by an expert before consumption. There are both variable characteristics and enough look-alikes that identification needs to be positive. However, once identified, it’s fairly distinctive. Morphological, cultural, enzymatic and DNA analysis suggests that there are five distinct species in this species complex. Consequently, both taxonomy and nomenclature are currently being revised both in the L. decastes group and in the genus as a whole. Researchers report that rats fed L. decastes have significantly lower cholesterol, serum triglycerides and phospholipids. Compounds that can inhibit cancer tumors in mice and also protect their cells from radiation have been isolated from L. decastes. In Japan, this mushroom is used in bioremediation of toxic sites and water purification systems. Melt 2 T. butter in a stew pot over medium heat; add onions, sprinkle with vinegar and saute onions until glassy. Add mushrooms and garlic, stew covered until mushrooms are soft, or about 15 minutes. Add 1/2 C. stock, potatoes, bay leaf, cumin, tomato; cover and stew until potatoes are cooked, or about 15 minutes (if the goulash becomes too dry, add more stock). In a small sauce pan, fry paprika in remaining butter for about 30 seconds. Add to the goulash, salt and pepper to taste, and serve.